Isobel's Running Blog Running. Running. Running. As the track at Withdean is still being resurfaced the Arena committee had planned a 6k race on the seafront starting at the Lagoon, running to the Peace Statue and back. The race would go off in groups sort of like the Adur challenge. This seemed like an excellent idea and indeed it would have been but for the Gits of Weather who had chosen a day of very strong winds and intermittent heavy rain. Luckily we managed to fit the race into a dry patch but it was windy as heck on the homeward stretch. I decided to make the most of the outward leg as I knew whatever I did I would grind to a halt as soon as we turned into the wind at the Peace Statue. I did. Those I was close behind on the way out had now disappeared into the setting sun which was directly at eye level all the way back. Blind and incapable of movement. Excellent. Some time later I arrived back at the finish line. If nothing this was a good tempo run. A massive positive split too I’d imagine. 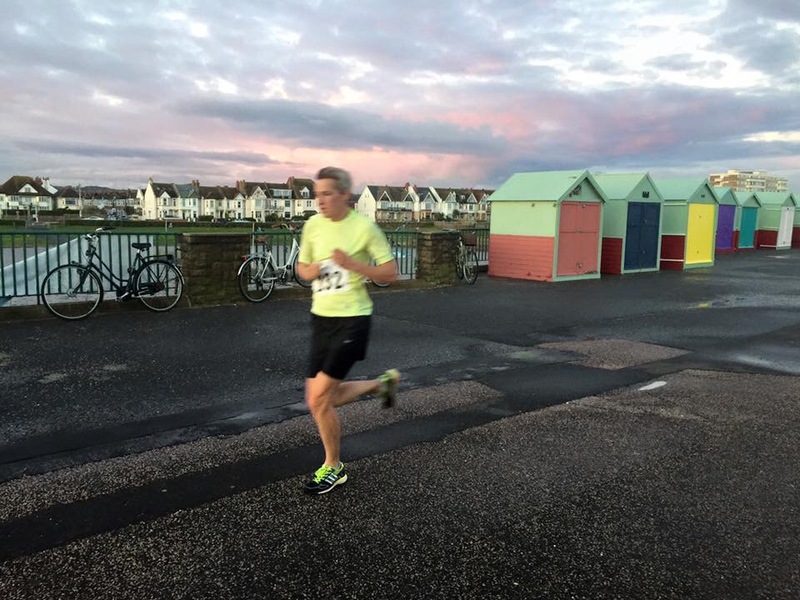 On Tuesday it was back to the seafront for almost an exact replica of Monday but this time it was Tom’s session of 2 x 3 miles and the weather was much more favourable with hardly any wind. Last time I did this I ran 20.43 then 20.52. This time I managed 20.43 for the first one but this time it felt much easier and I was chatting most of the way which I certainly wasn’t last time. After a 4 minute recovery we were off again. This time there was no chatting as my talking partner was well ahead. However I still felt comfortable and strong and arrived back in 20.21 which was rather surprising but excellent as it didn’t feel any harder than the first one. One of those rare occurrences where everything feels easy. On Wednesday Rob and I had planned for our usual k rep session but on arriving at Hove Park we discovered neither of us were up for it so Rob sensibly suggested we do a LSR instead which we duly did. 10.5 easy miles. He was right as we had already done two days of racing so we needed a bit of easy/recovery before we got stuck into even faster stuff. I also had work run club in the evening but this week I knew I had to lead a hilly run which was fine as it would be at a very easy pace. As it took longer to get to the hilly but than I thought it turned out not to be that hilly at all and only 3 miles. Perfect to round off an easy day. Thursday was now rep day so once again Rob and I convened in a dog filled Hove Park. This time there was no escaping it. We MUST rep. I was adamant I was not going to do the first rep too fast yet again. I did. 3.53. Luckily I somehow did the next the same speed, following it with a 3.56 and finishing with a 3.57. This was particularly good as A) I didn’t abandon the session like almost all the others we have done B) There were bloody dogs all over the place C) I had hardly even been able to cycle over due to a serious attack of the feebles. Rob managed his 4 reps all under 4 minutes even though he had to shout at ineffectual dog owners most of the way round. Why don’t dogs go on the grass? Surely they’d prefer it? It was only later that I discovered we were only having 100s recoveries rather than 2 minutes which made me all the more pleased with our dog-hampered times. Rob was right to change Wednesday’s run to an LSR. Good. I was given an unexpected day off work on Friday so set about doing nothing. It’s hard work resting but I managed it. The weather was looking good for Prom parkrun and indeed it was sunny and warm with only a minimal breeze (in seafront terms). The trouble with this is no excuses. However I really did have a stupid “lady” stitch thing as I was warming up. I gave it a good jabbing as I jogged about and luckily when the actual run started it went away to be replaced by a normal stitch which is fine as I know how to handle those. As usual I didn’t have any idea how this run would go though I had donned my racing shoes and watch (on countdown from 20 minutes) so a bit of me must have been optimistic. As long as my watch beeps for 20 after the last shelter I know I should be on for sub 21 and this was the case today. 20.46. Still a long way off the Emily-paced 19.47 I managed early in the year but acceptable. Once again as long as I feel like I have made the effort then that’s all that matters at the moment. 28 miles for the week (says Strava).